It’s been a couple of years but the big Linkage Show at the Embassy Theatre, Skegness is back! 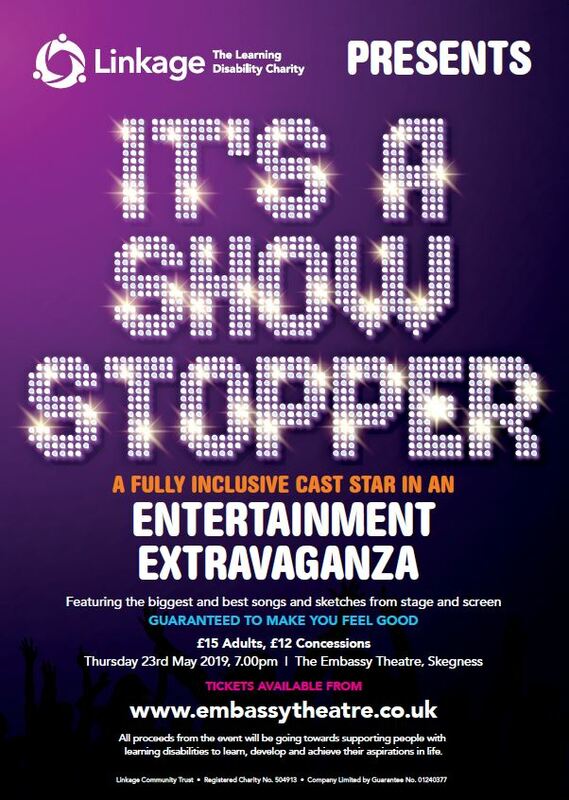 Tickets are now on sale for the 2019 entertainment extravaganza “It’s a Showstopper”. Over 100 performers from Linkage Adult Skills and Linkage College will be taking to the stage to put on the most spectacular Linkage show yet. With this event we’re looking to wow the audience, hence the name “It’s A Showstopper”. With a full production of lights and props, amazing tunes and energetic performances this show has a lot of heart and is guaranteed to make you feel good. Sing, dance and enjoy numbers from Disney, Sound of Music, Hairspray, The Greatest Showman, Les Mis and much more! There will also be guest appearances from pupils from local special schools St Bernards in Louth and St Lawrence in Horncastle. “It’s going to be absolutely fantastic. It’s the best show Linkage have ever done.” – Charlotte Hampson, cast member.